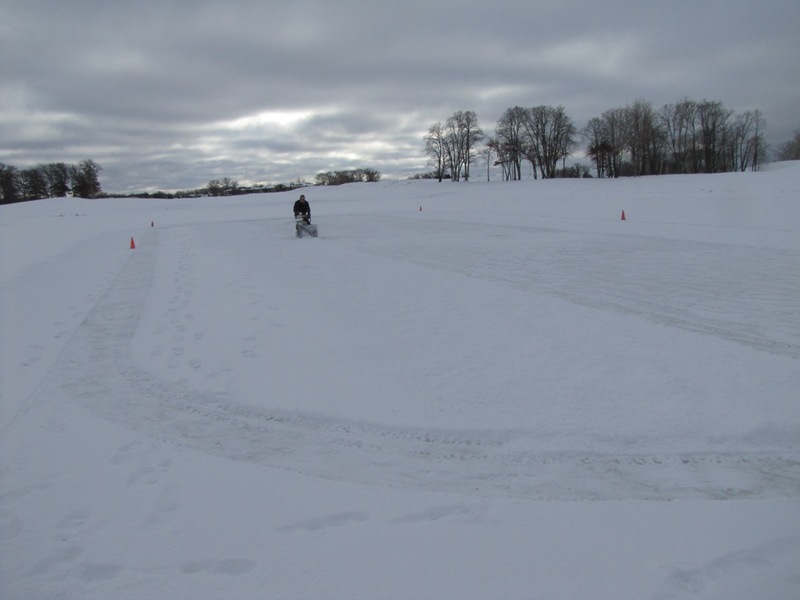 Good year for ice rinks of the homebuilt kind. 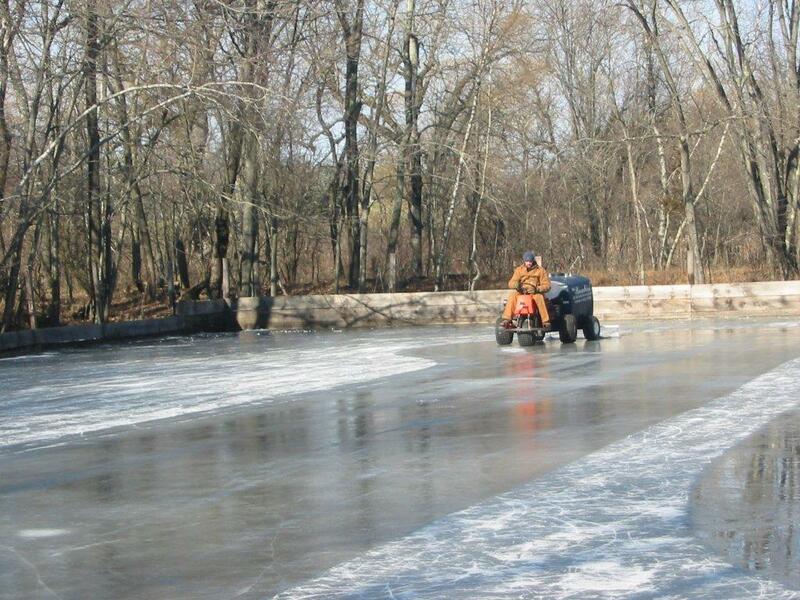 Couple years ago, I asked members of our MGCSA to submit photos of ice rinks they had made either at their course or at home. Got some great photos. Seems Minnesota isn’t the only state that likes to skate. 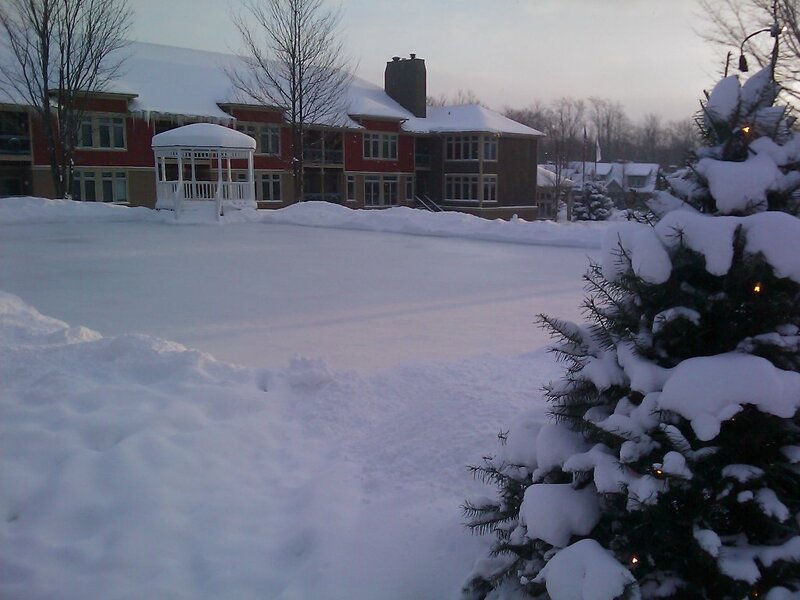 Adama Ikamas, CGCS sent in a photo from Crystal Mountain Resort & Spa in Thompsonville, MI. It is about 50′ x 80′. 150 to 200 hours are spent maintaining it each winter. 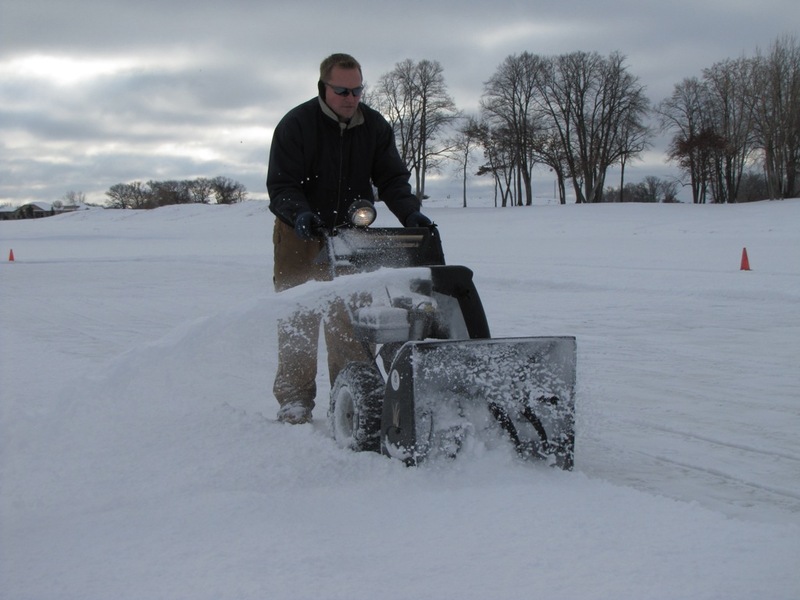 A 1″ hand watering hose and nozzle are used and of course some good old cold weather. 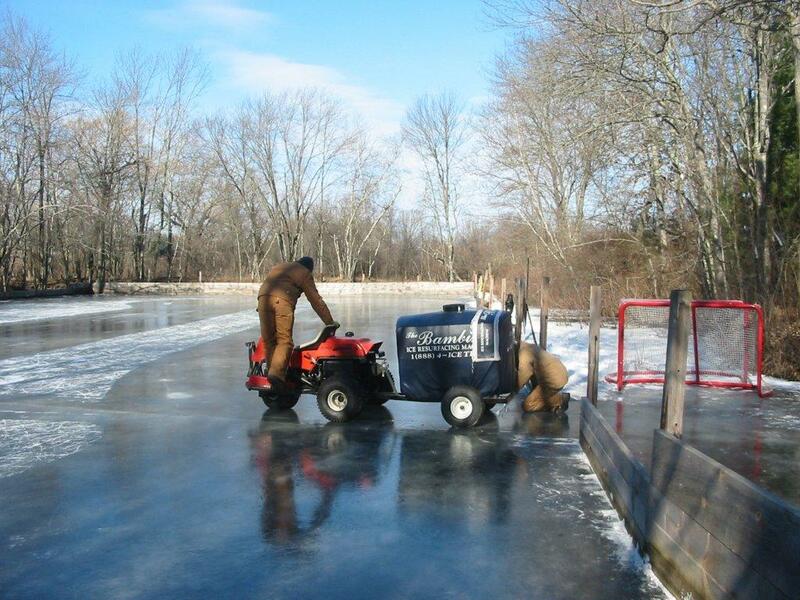 Michael Stachowicz, Superintendent at Dedham Country and Polo Club in Dedham, MA, sent in photos of the rink they maintain for their members. 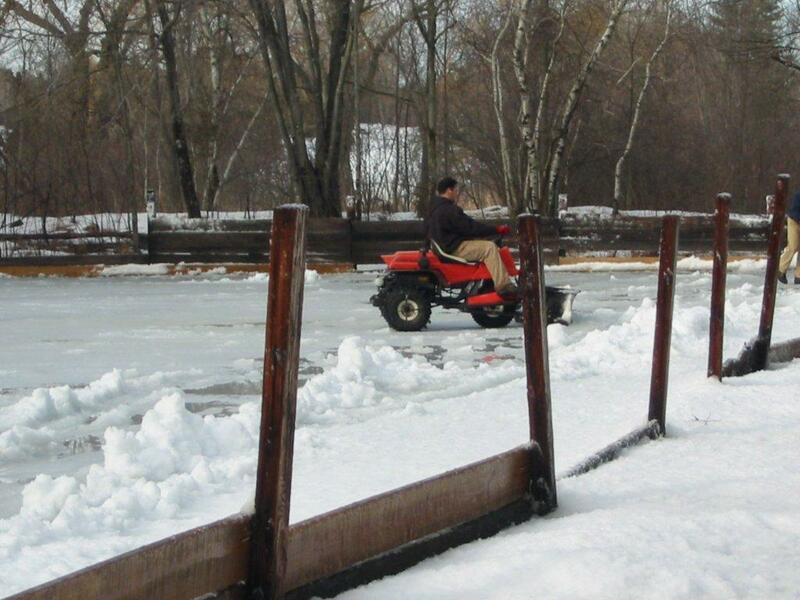 There is a lot of care that goes into their rink, but it really is enjoyed and used. 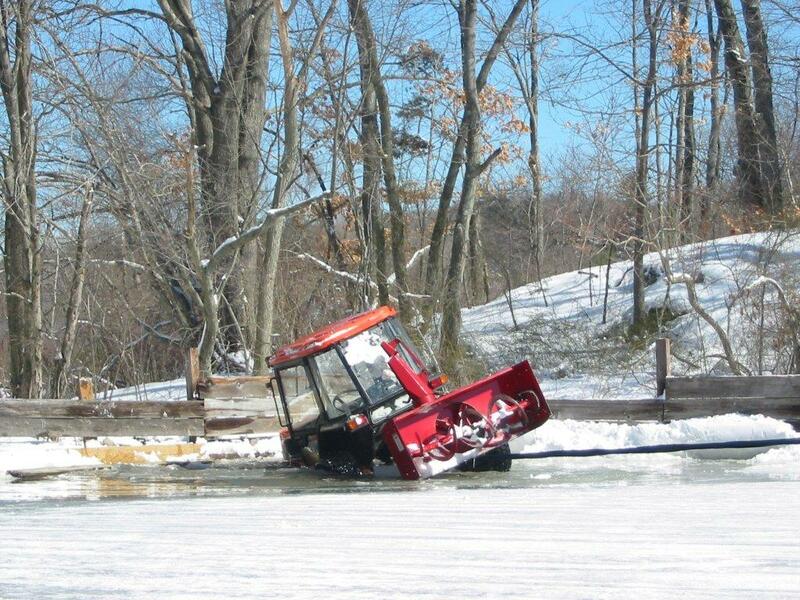 They use a mini Zamboni called a Bambini … which has really improved their ice. 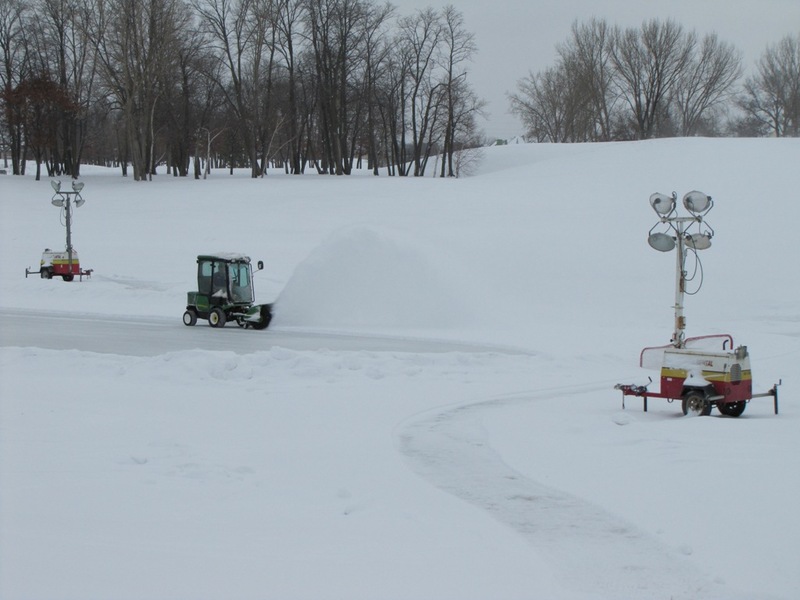 Andrew Carlson, Assistant Superintendent at TPC of the Twin Cities, sent in photos of the rinks, yes that is plural, they make two. 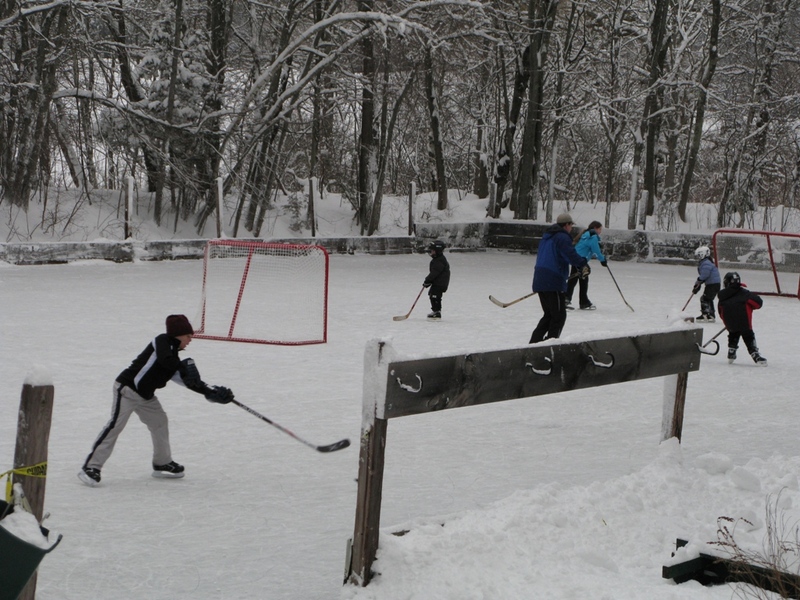 The small rink 90′ x 45′ is used for boot hockey. The large rink 150′ x 60′ is used for ice hockey. They bring in the big lights too. Go through your bunker rakes. Replacing broken heads and damaged handles. A hodgepodge of types, colors and conditions will be noticed by the golfers. Finally, a number of courses in our area use last year’s flag sticks, cups and flags for the early days of the season and then put out all new for the first outing of the year. Non-member clubs should start the year out with new to set the impression that brings back the golfers for their next round. Continuing on some easy Golf Course Accessory tips. Again, none of this stuff is new. It’s just a reminder that in your quest to provide those perfect turf conditions the simple stuff can sometimes just get overlooked. Most of my golfing friends can’t tell the difference between poa from bent, but they sure know when the accessories look bad. Perhaps unfairly, their decision on where to play next week might just hinge on that. Are you a walking course for many? Please give them a place to sit on at least some of the tee boxes. 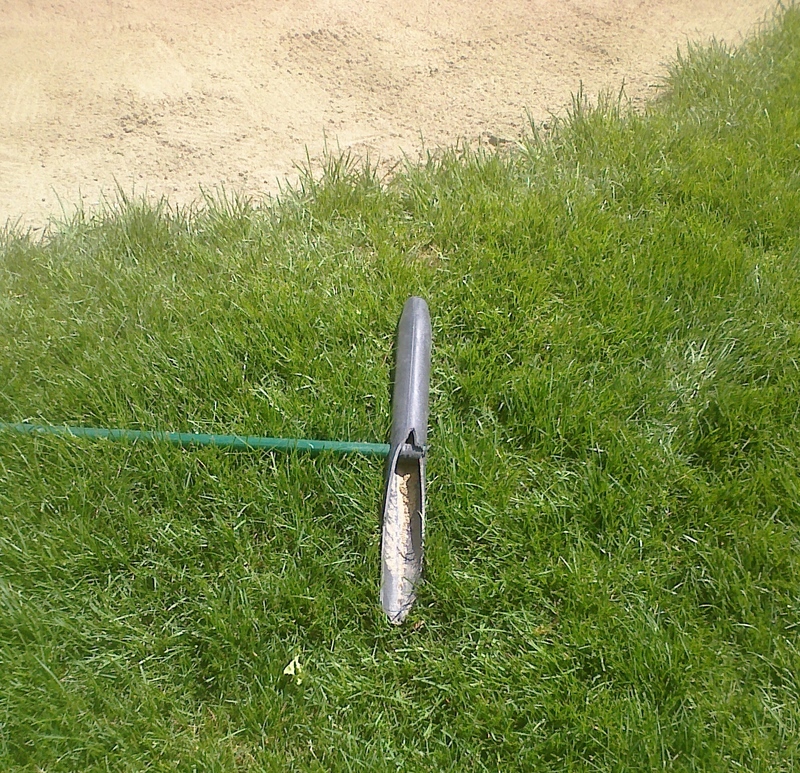 How about divot mix and broken tee boxes? I am familiar with one private club that assigned each tee box to 1-3 letters in the alphabet. Members were then asked to take responsibility for maintaining the hole with their first initial assigned to it. It actually became a matter of great pride as to who had the best maintained hole. If you have pictures or comments on some of the different things you do for your course and would like to share please pass them along. You can do so here or send to info@paraide.com and I will post them. Rounds are down, revenues are down, and the number of golfers is down. Can it all be blamed on the economic downturn? Surely some if not a lot attributed to job insecurity if not just plain lack of disposable income. However, when the dust settles and we head into a growth period, will the game be back as before? It will be back but to what extent? The demographics seem to support a surge in golfers as more and more baby boomers retire, maybe not as soon as they had planned, but retire they will. I am in that group and after actually burning out a number of years ago, I am ready to buy new sticks in 2010 and hit the links. Very good public courses are plentiful, privates are cutting deals for new members and it is still a social activity for both pleasure and business. Once folks settle into this age of internet connectivity and business picks up, I believe time will be made for a round of golf. If I have a concern, it is the connectivity I referred to above. Will folks be able to leave the iPhone and Blackberry’s in the car, or will they meld the two together? How will it affect the game? That is the question. I received an unusual request the other day. A customer in Africa asked if we made a stronger flag stick. Following some inquiry, it turns out that the general flag sticks available don’t seem to hold up to elephants scratching themselves on the stick. How does one answer that? A while back I requested photos of animals on golf courses. Let’s take that a step further. Through the years I have heard about animal abuse of all nature, involving kangaroos, bears, cows, squirrels, sheep, geese, etc. Do you have any photos of the damage or better yet, the culprits caught in the act? Here is a photo of a bear cub wrestling with one of our flag sticks at Whistler Golf Club in Bristsh Columbia, Canada. Thanks to Dave Gottselig, Superintendent at Whistler GC for sending in this great photo! No way I can resist calling attention to the first photo that appeared on the U.S. Open website today (6/18/2009). Sort of proves the old adage that one person’s loss is another’s gain. The U.S. Open players and spectators are enduring a rain delay in today’s opening round . . . but Par Aide products are hard at work!! These four workers are pushing Par Aide Accuform Squeegee Rollers!